Taxi for BlackBerry - it's time to go. Just this week, the boss, Thorsten Heins, was urging investors not to write the company off, begging for more time to let his three-stage turnaround strategy work. Shares fell by almost 30 per cent in June - just months after the much publicised launch of the Z10, the Q10 and OS, BlackBerry 10. You wonder how much time Heins needs - considering an instant success could be measured easily. 20 million Galaxy S4's sold by Samsung in two months, for example. That's the kind of maths Mr Heins is praying for. But it ain't coming, by the looks of things. Pre-Christmas, the tech world was eager to see what fruity treats the company formerly known as RIM could offer. But the January blues set in as punters and retailers realises the magic was gone. The Z10 appears to have been a flop. And even though BlackBerry and Selfridges were keen to point out there were queues for the Q10 when it launched exclusively there, one swallow does not a summer make. In fact, the swallow seems to have died on the wing and fallen out of the sky. Now, investors - and voyeuristic tech journalists who can see what's happening - are wondering how many second chances this company needs. Outside the gates of its HQ in the aptly-named Waterloo, this battle is being lost. Part of the problem is beyond BlackBerry's control. These days, apps sell a phone as much as the design and the OS. Would the iPhone be as popular if there was no third-party love, as was the case at launch? The twist here is that BlackBerry has always supported third party apps - before Google and Apple started biting into market share. Many were - and still are - poorly designed, overpriced tat, but the underlying fact is that RIM always had its doors open. The launch of the App World made that official but many of the big names have stayed away. BlackBerry has made a nice looking shop with a lot of crap, expensive stock on the shelves. It wasn't always this way. 10 years ago, a BlackBerry was the status symbol. Hell, even five years ago, it was a big deal. When I received a company BlackBerry while working at the BBC, I was giddy with excitement - not at the model, since they'd gone budget (license fee money, after all), but the fact I suddenly became somebody. And BlackBerry was diversifying. Out went the fear of cameras (lest security-conscious IT managers screamed about espionage concerns) and in came a big push to get BBM down with the kids. For the last few years, BlackBerries have been just as synonymous with teenagers as traders. But the advent of services like WhatsApp is once again proving that there are alternatives out there. And don't even go there with the PlayBook. #FAIL. So, where does it go from here? Here's a radical idea: why doesn't RIM ditch OS 10 and adopt Android? It may sound crazy on the surface, but there are reasons why this could work. Firstly, Android and iPhone sales are taking away what was once BlackBerry's core market. This would allow RIM to tackle the competition head on with an if-you-can't-beat-them-join-them approach. Secondly, it would give RIM instant access to a huge app library, with all the big names. And thirdly, as we've seen with the likes of the Kindle Fire and Nook HD, Android can be tailored to look and feel exactly as the owner wants. An Android-running BlackBerry could be made to look exactly like an OS 10 running BlackBerry, to make the user feel familiar and comfortable with what they're holding. The beauty is here that BlackBerry can have its cake and eat it. It can still run its services independently within an Android framework if it wants to reassure customers. Remember the Siemens SK65 or the Nokia E61? 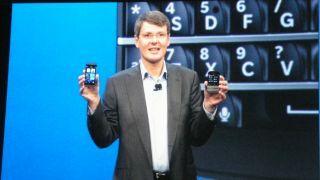 Both third-party handsets, which accessed BlackBerry's services. Neither sold well, but they were examples of RIM's core service working on other native operating systems. This may be akin to dancing with the devil. But if RIM doesn't stand up and put those dancing shoes on, it may find itself waltzing off into the sunset sooner rather than later. I've reviewed dozens of phones and tablets for TechRadar over the years - each time putting them through their paces in the most unbiased, rigorous way possible.